Addictive recreation of an old-time favorite. 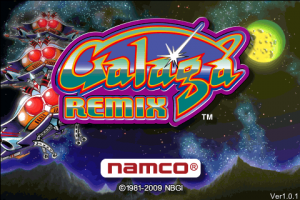 Galaga Remix was created by Namco, and it is a brilliant remake of the original arcade game. 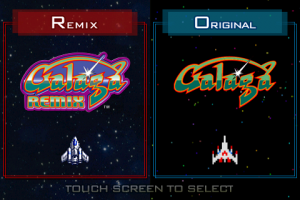 Galaga Remix includes an updated version as well as the original 1981 Galaga. The old version of the game does allow you to reclaim a captured ship so you can have double the firepower with dual ships like in the old arcade game, however this app really shines with the updated version. 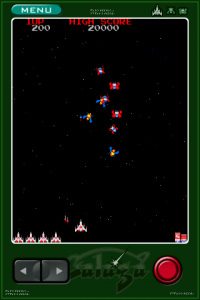 The new Galaga’s graphics are much easier on the eyes, and includes new boss battles, multiple upgrades for your ship, and plenty of levels. The rest of the review is after the break. One feature from the old Galaga was to save a ship if it got captured, which then would give you a dual fighter, the updated Galaga takes that idea and runs with it. If your ship is captured by one of 3 different types of enemies, once you free your ship, it will give you a new ability, a different one based on which enemy captured you. You can upgrade in three different ways, a more powerful attack, a spread shot, or faster shooting. Each one of these can stack twice, or with one other ability. So, you can get yourself a fast shooting spread attack, or stack two power attacks to make a devastating super cannon. This allows you to create a total of 9 ships (3 basic upgraded ships, and 6 stacked upgraded ships). The game gives you several different methods in order to control your ship, either with arrow buttons, a slider, or you can use the built-in accelerometers. However, due to the portrait setup of the classic Galaga, the controls are a bit harder to use due to their small size. 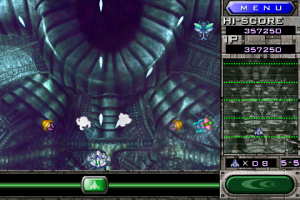 For the updated version, since it is in landscape, the controls are much easier to use. The only thing I could complain about is that it never is quite clear which monsters will kamikaze into you, or if they will change direction at the last moment and avoid a collision. This does keep it more true to the original, but Namco has shown they can take an old concept and make it much better, so it would be nice if they would give you a warning when you are about to get rammed by one of those buggers. Other than that, it would be nice to have some more levels, the game comes with a little over 30, but the more the merrier. Great visuals, a good variety of gameplay, and 30+ stages, Galaga Remix is available at $5.99, so go grab it from the App Store here.